Thirty-two untrained men [mean (SD) age 22.5 (5.8) years, height 178.3 (7.2) cm, body mass 77.8 (11.9) kg] participated in an 8-week progressive resistance-training program to investigate the "strength–endurance continuum". Subjects were divided into four groups: a low repetition group (Low Rep, n=9) performing 3–5 repetitions maximum (RM) for four sets of each exercise with 3 min rest between sets and exercises, an intermediate repetition group (Int Rep, n=11) performing 9–11 RM for three sets with 2 min rest, a high repetition group (High Rep, n=7) performing 20–28 RM for two sets with 1 min rest, and a non-exercising control group (Con, n=5). Three exercises (leg press, squat, and knee extension) were performed 2 days/week for the first 4 weeks and 3 days/week for the final 4 weeks. 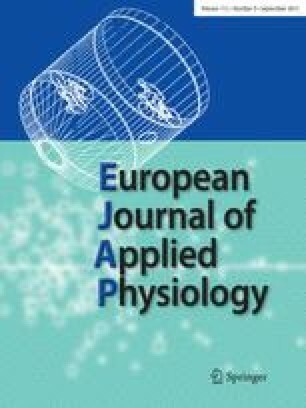 Maximal strength [one repetition maximum, 1RM), local muscular endurance (maximal number of repetitions performed with 60% of 1RM), and various cardiorespiratory parameters (e.g., maximum oxygen consumption, pulmonary ventilation, maximal aerobic power, time to exhaustion) were assessed at the beginning and end of the study. In addition, pre- and post-training muscle biopsy samples were analyzed for fiber-type composition, cross-sectional area, myosin heavy chain (MHC) content, and capillarization. Maximal strength improved significantly more for the Low Rep group compared to the other training groups, and the maximal number of repetitions at 60% 1RM improved the most for the High Rep group. In addition, maximal aerobic power and time to exhaustion significantly increased at the end of the study for only the High Rep group. All three major fiber types (types I, IIA, and IIB) hypertrophied for the Low Rep and Int Rep groups, whereas no significant increases were demonstrated for either the High Rep or Con groups. However, the percentage of type IIB fibers decreased, with a concomitant increase in IIAB fibers for all three resistance-trained groups. These fiber-type conversions were supported by a significant decrease in MHCIIb accompanied by a significant increase in MHCIIa. No significant changes in fiber-type composition were found in the control samples. Although all three training regimens resulted in similar fiber-type transformations (IIB to IIA), the low to intermediate repetition resistance-training programs induced a greater hypertrophic effect compared to the high repetition regimen. The High Rep group, however, appeared better adapted for submaximal, prolonged contractions, with significant increases after training in aerobic power and time to exhaustion. Thus, low and intermediate RM training appears to induce similar muscular adaptations, at least after short-term training in previously untrained subjects. Overall, however, these data demonstrate that both physical performance and the associated physiological adaptations are linked to the intensity and number of repetitions performed, and thus lend support to the "strength–endurance continuum".